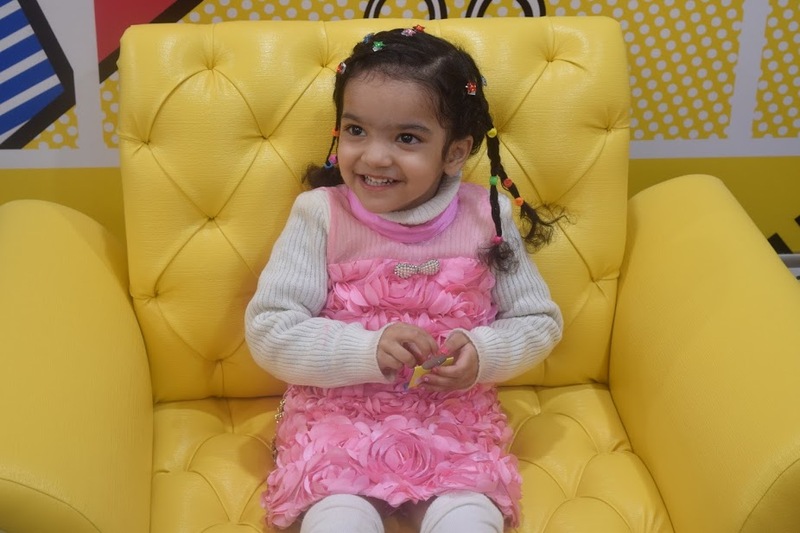 Flick Kids Salon– This new baby of Deepika Khaitan and Sanjana Nath ensures that you can conveniently expect nothing less than superior service with warm and experienced stylists who are committed to making the experience a FUN and pleasant memory for all. Both of these young and vibrant entrepreneurs embarked on an entrepreneurial journey with Flick basis a unique idea of opening a strictly-for-kids salon. Every kid deserves to be treated special! To understand that, I along with my daughter Aannikaa invite you to join us on a small trip inside this awesome place. As we opened the door, we saw bright and colourful interiors, cozy and comfy furniture and smiling staff to welcome us to this absolutely gorgeous salon. Coming in and looking around I noticed a special room for my precious sweetheart, where she could not only play with educational toys, but also interact with other kids. Aannikaa spent quality time while waiting for her turn. Great engaging activities to keep the lil ones busy, it is a fun place for kids of different ages for sure. I as a parent also had something to do while my little munchkin was busy playing- check out the dessert counter and take a look at their children products specially designed for kids. Oh amongst all this how can I forget that Flick is not only about fun. 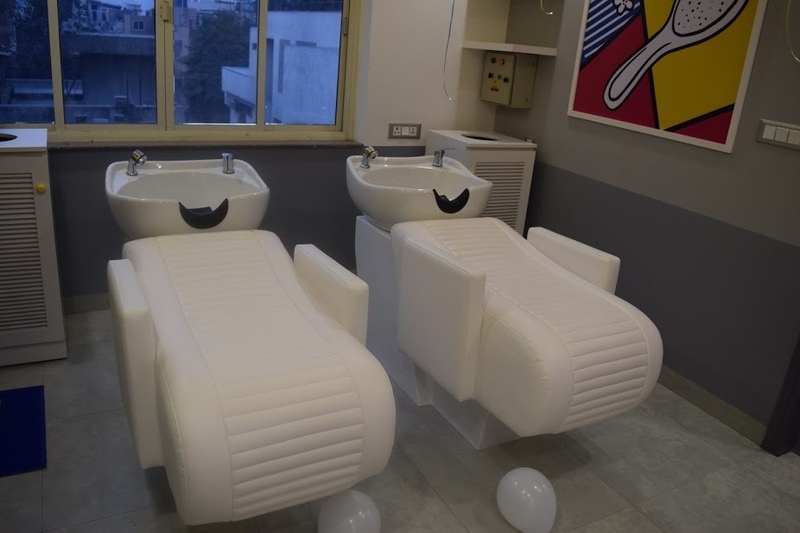 It is a professional beauty salon ready to provide little clients with the highest-quality professional and best in class services to transform the chore of going for a haircut or treatment into a ‘treat’ for kids. The most important aspect is the standard of quality and hygiene as well as a well-trained staff equipped to work with children. Flick also launched their own product range called ‘Naturally for kids’ which includes a completely natural and paraben-free range of products including shampoos, moisturizers, nail polishes and soaps. These products are used at the salon and also retailed at the salon itself. Aannikaa was pampered by the therapists and hair stylists making it a delightful and luxurious experience for her. By the way- she is already looking forward to her next visit. Flick Kids Salon is a whole world devoted to children. It is one of its kinds in town where you can spend quality time with your child! 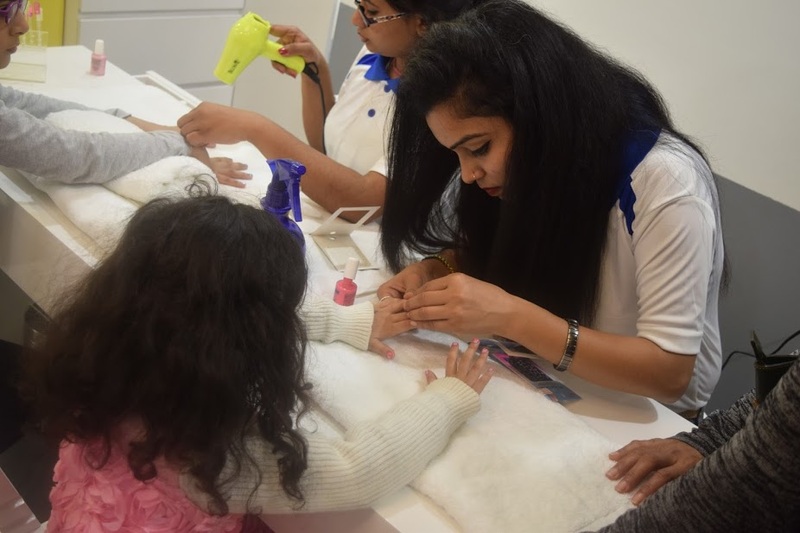 Be it a special party destination for spa-theme, disco or pyjama birthday parties, special first haircut ceremonies, or hair grooming and cutting as well as spa services to pamper little hands and feet, Flick does it all. Do check out and make your child feel like a star! Deepika Khaitan: Deepika is a qualified pastry chef with a degree in Hotel Management from Johnson and Wales University (Rhode Island). She has worked with top hotels like Hyatt Arlington (Washington DC), Foxwoods Resorts and Casino (Connecticut) ,Taj Bengal (Kolkata) and left her last job at Oberoi Hotel as a Pastry Chef (Kolkata). After her stint at some of the world’s top hotels; Deepika moved to Delhi and started ‘Deepika Khaitan Cakes’ soon becoming one of the cities most recognized names specializing in some of the best technique in sugar art that has been in the past 8 years. A major focus of her work was on childrens’ cakes and with three children of her own she decided for her next business venture to also be focused on children. Deepika has been awarded orders from leading brands of the world such as Ferragamo and Bobbi Brown, and her regular clientele consist of most of the cities key celebrities and opinion leaders. Sanjana Nath: Sanjana being a graphic designer by profession, comes with over two decades of experience having worked with some of the largest advertising and design firms including McCann Erickson and Ogilvy. She continues to freelance as a designer with a passion for out-of-the box creativity in design. It is this creativity that has also formed the core ethos of Flick. As design flows in her veins, Sanjana has been the main visionary behind the curated look and feel of Flick that completely stands out and is extremely attractive and aimed to please children across ages. Mi Air Purifier: Our investment this festive season!